Since the tasting of the Glenfarclas 25yo at a recent D.T.W.C. meet-up, I had been keen to 'get me some of that action'...giddy up! So with a wee bit of risk as usual I chose the Glenfarclas 10yo and like nuns undies in a candle shop they were off and I was ready for anything. How could it all go so wrong? Truly the disappointment is bearing and any purchase of this 10yo comes with a warning. 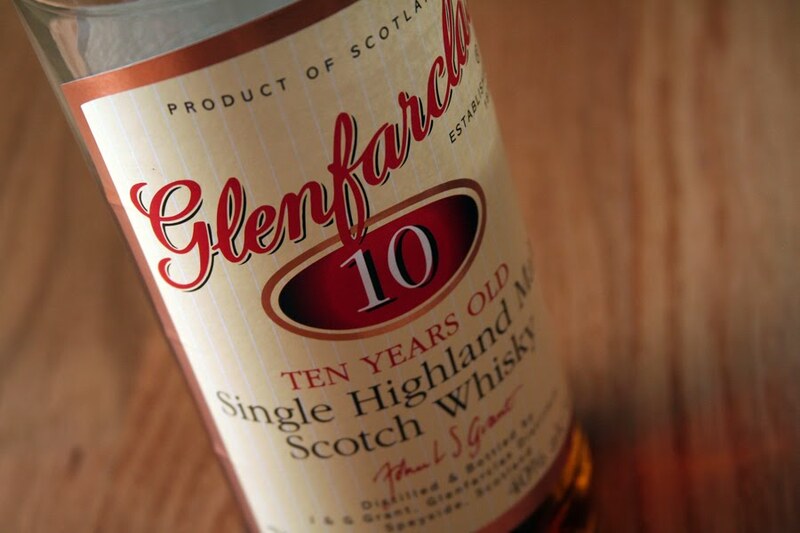 OK so expectation aside where are we at... oh yes the Glenfarclas 10yo. On the nose: it is light citrus, crisp and with sweet sherry notes (sounding good? just wait). Probably the oddest thing at this point is a slight fresh raw egg smell (I cook enough to recognise this smell anywhere) and if you do not get that then try thinking about a warm freshly baked Portuguese egg tart (Hong Kong style of course, is there any better I ask you). To taste: it all goes down hill very quickly. Again, at first there is the light crisp taste (just like on the nose), the creamy citrus (much like a Glenmorangie) is much more prominent and quickly you find the sherry before it turns to a sharp, almost perfume dryness on the roof of the mouth (for those that have tasted perfume before)! The finish is so short you almost miss it. A short spike, mild warmness in the chest before a nasty cigar ash settles on the tongue. But wait it gets worse, over a period of 10 min to 30 min the ashen flavour permeates to the back of the throat. Oh yes, I really do mean cigar ash (I have had enough post morning cigar experiences to know what this tastes like). God it just ruins everything. Potentially for a smoker this actually might be a good thing. It really is a lack luster affair to mess around with the 10yo but in saying that I am still keen to work through the Glenfarclas family and think I might move to the 8yo before going back up. With such a wide range of expressions by Glenfarclas there is bound to be one ugly son. If I was to give a dram 4 out of 7. You probably will not want to finish the bottle. Note: If you do not enjoy that dry ash flavour I have found the 10yo improves with food such as with hot baked banana bread (just like I am munching on now). Food seems to remove the ashiness. It is also of note that just about everything I have said is in direct contradiction to what is printed on the label. I never believe what a manufacture prints on a label and have made a point not to read the label before I have made a purchase or before I have had a dram.